Dr. Smith's ECG Blog: "Shark Fin": A Deadly ECG Sign that you Must Know! A 75-year-old man collapses to the ground in cardiac arrest while shopping with his wife. Medically trained bystanders happen to witness the event and begin CPR right away. Paramedics rush to the scene and find the man to be in V-Fib. He is intubated and shocked 3 times prior to arrival in the ED. He comes in with CPR in progress via LUCAS device and is now in slow PEA. An intra-arrest arterial line is placed. After 3 more rounds of chest compressions there is a sudden spike in ETCO2 and the A-line shows a BP of 70/40 mmHg. Bedside Echo reveals what appears to be stunned myocardium with poor systolic function. Vasopressor infusions are started. There are wide complexes with a regular rate at around 65 bpm. With complexes this wide one should think of toxicologic or metabolic causes of arrest. In particular one should consider profound hyperkalemia. But take a close look at the unique morphology of these particular complexes: notice how they look remarkably like Shark Fins. They are not QRS complexes but rather a combination of QRS and T-wave. What they represent is massive ST-Deviation! This is a junctional rhythm with massive ST-Elevation in leads II, III, and aVF, with massive reciprocal ST-depression in leads I & aVL. There is also ST-Depression in the precordial leads maximal in V2-V4 consistent with Posterior involvement. What you are looking at is a Massive Infero-Posterior STEMI! The key to seeing and understanding how these complexes represent profound ST-Deviation lies in delineating the end of the QRS . 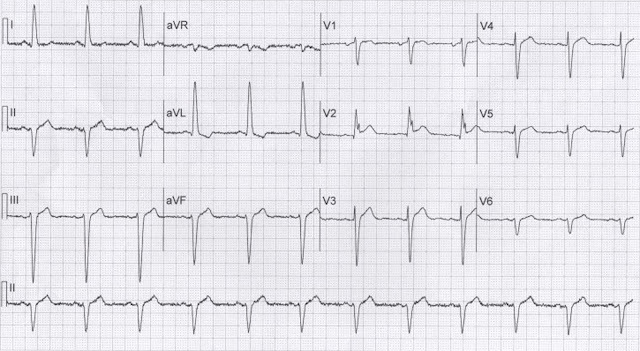 The problem is that with this unique morphology, the QRS complex and T-wave merge together as a result of extreme ST-Deviation, and the two become indistinguishable. But remember this: If you can find the end of the QRS in one lead, you can find the end of the QRS in any lead. Look in all 12 leads and find one which clearly shows the end of the QRS. Here lead V5 happens to show the beginning and end of the QRS very nicely. Now all you have to do is simply draw a line straight up from this point (J-point) in V5, and you can find the same point in any lead. The profound ST-Deviations suddenly become glaringly obvious and you can now easily appreciate the classic pattern of Massive Infero-Posterior STEMI! With hyperkalemia an ongoing focus, there was continued delay in catheterization. The patient was given multiple doses of calcium, insulin, glucose, and multiple ampules of sodium bicarbonate without any response or improvement of shock. He subsequently became bradycardic and a decision was made to pursue transvenous pacemaker insertion. In the process, the patient arrested once again and required an additional round of CPR to regain a perfusing circulation. Given persistent shock the decision was eventually made to proceed with coronary angiography, which revealed a 100% thrombotic RCA occlusion. During attempts to open and stent this culprit lesion the patient arrested yet again. Unfortunately this time he was unable to be resuscitated. 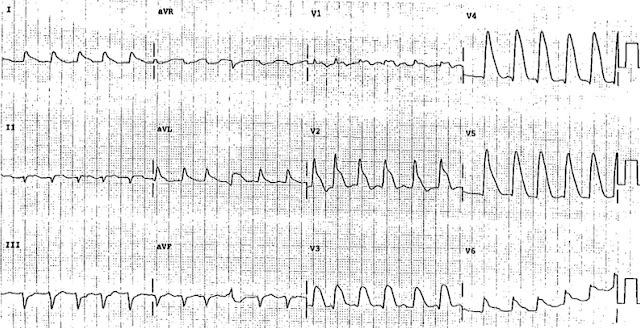 The literature on this distinct ECG phenomenon is scant, consisting essentially of case reports--blog, book, and journal[1-11]. Therefore, its incidence is unknown. Presumably many cases go unrecognized and are mistaken for conduction abnormalities, metabolic derangements, or toxicologic insult. From the cases that have been described, Shark Fin appears to be an ominous sign with a strikingly poor prognosis. What would you think if you saw this on the monitor before obtaining a 12-lead? 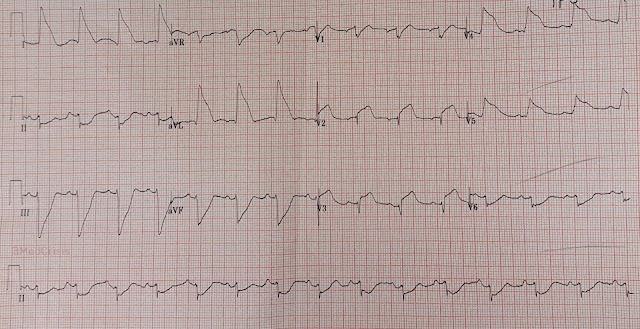 ?You can see how easily Shark Fin ST-Elevation could be mistaken for a Wide-Complex Tachycardia! A term that has been used in the literature to describe Shark Fin morphology is "Giant R-waves"[8-11]. This designation is suboptimal for a few reasons. Firstly, Shark Fin morphology represents extreme ST-Deviation which encapsulates both ST-Elevation as well as ST-Depression. 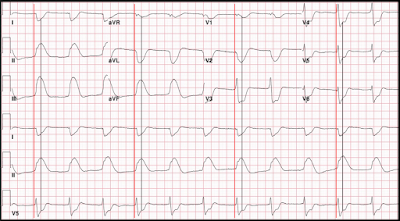 ECG territories with Shark Fin reciprocal depression will not have R-waves, but rather S-waves. More importantly, the term "Giant R-wave" is problematic because it has also been used in the literature to refer to R-waves that are only mildly prominent and come nothing close in size or morphology to the ECG phenomenon described in this post! We think "Giant R-wave" is not a good term for this. Shark Fin is an electrocardiographic sign of acute coronary occlusion. 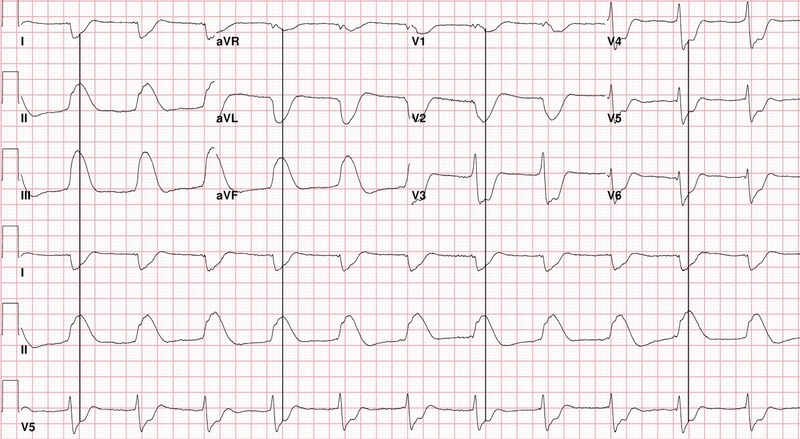 It is a unique ECG phenomenon consisting of complexes formed by the blurring together of QRS and T-wave as a result of extreme ST-Deviation. 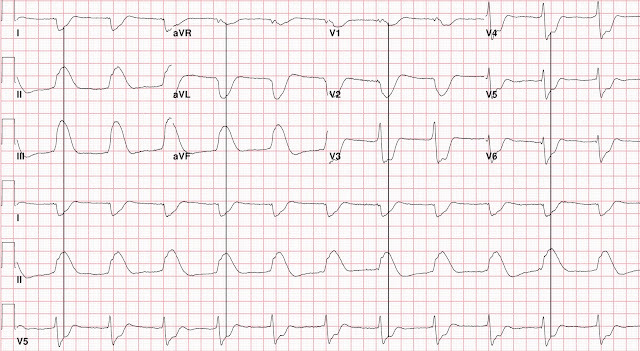 These complexes manifest in contiguous ECG leads corresponding with coronary anatomy, and represent transmural ischemia. Shark Fin Sign should be recognized based on its characteristic morphology, and confirmed by delineating the J-point using the technique described above. 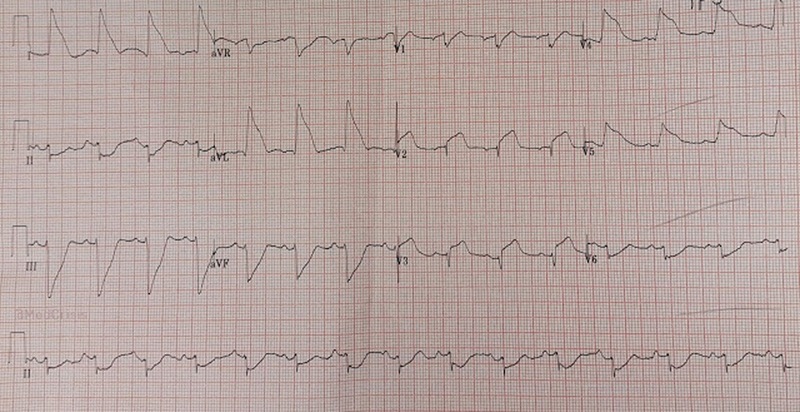 While there is a paucity of literature on the topic, the presence of this sign appears to be associated with a significant mortality, underscoring the critical importance of prompt recognition and emergency reperfusion. Superb explanation by Drs. Sam Ghali and Steve Smith of this highly insightful case with tragic outcome. I’ll add Figure-1 below, in which I follow the same technique that Dr Ghali used to delineate the end of the QRS complex. Although precise determination of QRS onset is challenging due to a seemingly short isoelectric segment seen in several leads — I believe the vertical RED lines capture the beginning of the QRS. This suggests that there is some QRS widening, although clearly far less than initially thought because of the shark fin phenomenon. I believe there is underlying bifascicular block — which goes in concert with extensive ongoing acute infarction. 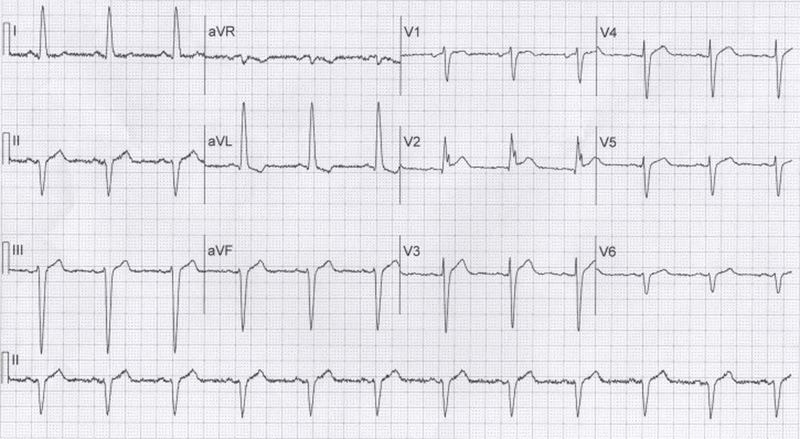 While lacking amplitude, the QRS complex in lead V1, appears to be a triphasic, and associated with wide terminal S waves in all lateral leads. One could debate whether terminology is best served by calling this IVCD vs RBBB — but given the rS pattern in lead I (with steep decline and predominant negativity from the S wave in this lead) + predominant R waves in each of the inferior leads — I submit that the most logical explanation is combined RBBB/LPHB. Our thanks again to Dr. Ghali for presenting this case! Figure-1: Vertical RED line shows where I believe the QRS begins. BLACK lines drawn by Dr. Ghali show the end of the QRS complex in all leads. 6. Smith, SW et al. The ECG in Acute MI: An Evidence-based Manual of Reperfusion Therapy. Lippincott Williams & Wilkins. 2002. 8. Faillace RT et al. The giant R wave of acute myocardial infarction. Jpn Heart J. 1985. Mar;26(2):165-78. 9. Madias JE. The "giant R waves" ECG pattern of hyperacute phase of myocardial infarction: A case report. J Electrocardiol. 1993;26(1):77-82. 10. Madias JE et al. Transient giant R waves in the early phase of acute myocardial infarction: Association with ventricular fibrillation. Clin Cariol. 1981. 11. Testa-Fernandez A et al. "Giant R wave" electrocardiogram pattern during exercise treadmill testing: A case report. J Med Case Rep. 2011 Jul 11;5:304. 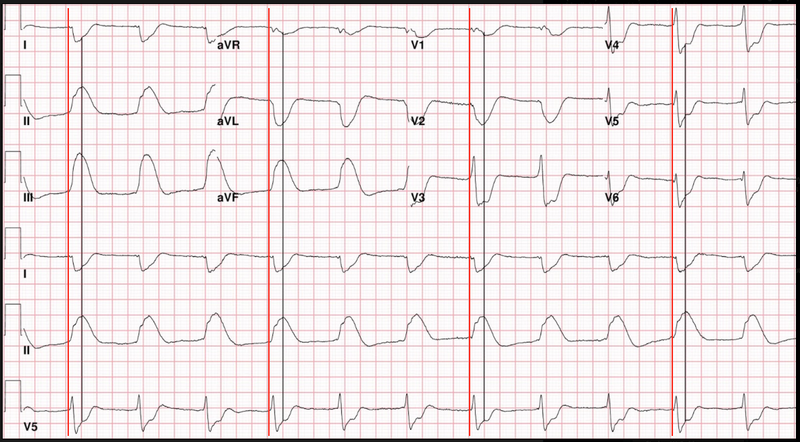 The fact that some of the precordial leads have part of the upper portion of the QRS complex narrow an indicator that this is not Hyperkalemia? Excellent post, sorry about the delay and the outcome. Hopefully we can prevent this in the future by excellent posts like this. Thanks for sending! I'm wondering more about the reasons for delay in cath. Post-arrest ROSC, why not? 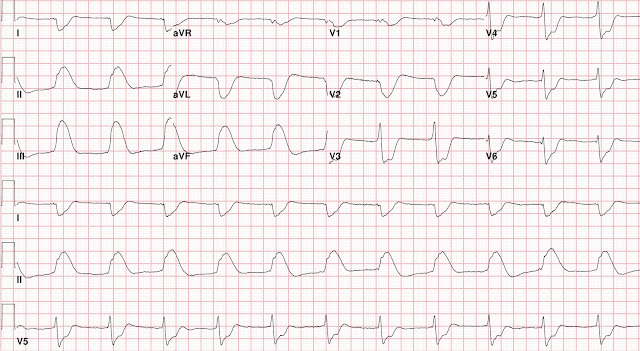 Delaying cath after a normal K+? In a guy not known to be on dialysis? Sounds like **active wishing** for hyper K+. I've heard that some interventionalists reluctant to take these extremely sick post-ROSC patients to cath because of the way some retrospective reviewers hold any death in the cath lab against them for purposes of quality measures. But that's just a rumor I've heard. its very disconcerting when our cardiology colleagues are resistant. excellent case, and analyses. terrible outcome. Great review! Looking into the literature on this, I found two recent references from Cipriani et al and Ruiz-Pazarro et al. They describe this finding as Triangular Waveform or Graveyard sign. Cipriani reported this finding retrospectively in 5/367 (1.4%) of STEMI. The authors reported a very high right of LMCA occlusion cardiogenic shock and death with this finidng.